89th Regiment presented with new Colours and retitled. The Royal Irish Fusiliers Troop the Colour, Portadown. Cap badge of The Royal Irish Fusiliers. The Prince of Wales feathers and harp were bestowed on the 87th Regiment following its great victory at the Battle of Barrosa in 1811. 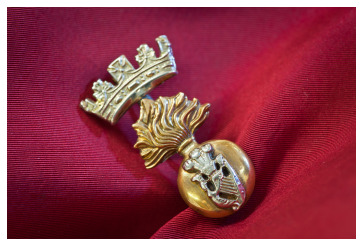 The flaming grenade was a common element in the cap badges of all infantry regiments granted the distinction 'Fusiliers'. In 1827, King George IV approved the 87th this distinction with the title 'Prince of Wales's Own Irish Fusiliers' and some months later adding 'Royal' to become 'Royal Irish Fusiliers'. In 1881 the 87th was amalgamated with the 89th (Princess Victoria's) Regiment of Foot, which became the Regiment's 2nd Battalion. The 89th brought forward the royal coronet that had been bestowed by Queen Victoria.